Perfection By The Slice: Serving Perfect Pizza Since 1946. Seven decades ago, you couldn’t get a “Detroit Style” square pizza in Detroit. Or anywhere else. Cloverleaf founder Gus Guerra changed all that. The ingredients: His first bar and restaurant, Buddy’s Rendezvous. His wife Anna Passalacqua’s traditional thick-crust family pizza recipe. And the desire to make the very best pizza the Detroit area had ever tasted. Nobody had ever tasted anything quite like this. Thick, perfectly-crisped crust, topped with a thick layer of select cheese. Hand-sliced premium meats and vegetables. A generous amount of savory, perfectly-spiced sauce. All baked to perfection in a traditional stone oven. 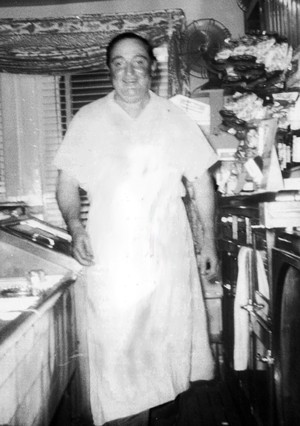 Gus Guerra’s creation was an immediate sensation, and the original Detroit-style square pizza was born. In 1953, Guerra decided to strike out on his own, amicably separating with his Buddy’s Rendezvous partners to purchase the Cloverleaf Bar and Restaurant in East Detroit (now Eastpointe). The small neighborhood bar was soon packed with families hungry for Gus’s one-of-a-kind “Motor City Square.” The original Cloverleaf grew into the Eastside institution that it is today as successive generations of customers made it their regular destination – and family tradition. Today, Cloverleaf’s carry-out and delivery locations serve up their premium-quality pizza just as Gus would make it – and did make it. The original Cloverleaf family recipe hasn’t changed in 68 years—and people who know and love pizza wouldn’t have it any other way. When everyone tries to copy you, chances are you’re doing something right. Cloverleaf’s original Detroit-style square pizza has been copied by mom-and-pop shops and major national chains—but the great Cloverleaf taste is never equaled. Gus Guerra knew that it’s the small details that make a perfect pizza. Dough that’s made fresh daily, and never used past its prime. Premium-quality meats that are hand-carved to perfect thickness. Produce that’s purchased daily from local suppliers, carefully inspected, and hand-cut on the premises. Careful hand preparation of each individual pie, and finally careful baking on stone in a traditional deck oven. It’s how Gus Guerra made the perfect pizza. And it’s how we still do it today. Because if there’s one thing that shouldn’t change, it’s perfection. Listen to Stephen Clark and JoAnne Purtain from WOMC talk about the famous Guerra family Detroit Style Pizza.